Formed in 2002, American Muscle Car Club (AMCC) is pretty easy to understand. Our name says it all – we are a car club that loves American muscle cars! 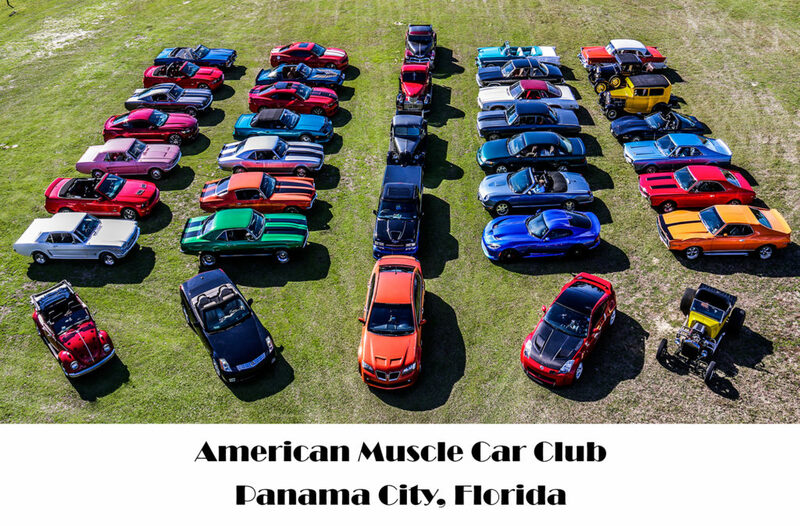 We are based out of Panama City, Florida and we’re always looking for new members who want to be active in the car community by representing us at events, attending club meetings to fellowship with other members and participate in AMCC hosted events. Don’t let our name fool you, membership is not limited to strictly “muscle cars” — we love all cars! Our members have all types of automobiles from T-Buckets and Corvettes to everything in between; some of the older rides are 100% restored, others are not but we appreciate them all. Your car does not have to be a “show car” to join. Be sure to check out the “Our Rides” tab to see the beautiful vehicles that our members own!! We make our way around the Southeast United States attending car shows, car events and exploring the roads in search of what’s new around the corner. We love road trips and meeting new, friendly people who care about their cars, their neighbors and other car enthusiasts. We are very active in our community and we support our charity Project 25 with an annual Car Show the first Sunday in November. 100% of the proceeds from the show go directly to a Project 25 representative on the day of the show. We also have several candy machines throughout the county and the proceeds from those also go to Project 25. Over the years, we have donated over $155,000 to Project 25 in cash and merchandise. Throughout the year, we host multiple cruise ins for charity. In 2018 we accepted donations of cash and merchandise that benefitted the Sims Veterans Home, the Humane Society of Bay County and also Angel’s Pantry Foodbank. We support the various other car clubs in Bay County by participating in their monthly cruise ins and annual car shows. They have a variety of rides to check out and dozens of friendly people to meet and interact with. We are also a founding member of the BC4 (Bay County Car Club Coalition). Visit them at www.bcfour.com for more information on Bay County Car Clubs and events. We have monthly business meetings (January – November) on the 2nd Thursday of each month at O’Charley’s Restaurant on 23rd Street in Panama City. The meetings start at 6:30 but most of our members come early to eat and socialize. Guests and those interested in membership are always welcome. Instead of a December meeting, we have our annual Christmas Party. You can learn more about our club, our members and upcoming events if you visit our Facebook page. Like what you see and want to be a part of the American Muscle Car Club? We are always looking for new members who want to be an active part of our club that attend club meetings, participate in local car events and help out at AMCC hosted events. Now for the fine print: We do not accept applications from prospective members that we have not met in person. You must come to a club meeting or to a car event that we are attending and meet us first. Still interested? Click on the Membership Information tab and download our club application and by-laws. Fill out the application and return it to us once we’ve met you. Not sure it AMCC is the right fit for you? We’ll be happy to provide you with information on other clubs that you might be interested in. We love new members but we want to make sure you choose the right club! Our members are always out and about in the Florida Panhandle, Southern Alabama and Southeastern Georgia so be on the lookout for them.